Twitter really hasn’t made many changes since it was first launched in 2006 and whilst it’s possible to personalise the background of your profile with your own design, this feature is not something that has really caught on for the average user. However, this has recently changed and it’s now possible to upload a cover photo, similar to Facebook Timeline’s cover pics. Of course, many bemoan the frequent changes to Facebook as it does tend to make the site somewhat ‘buggy’ and of course, some people prefer a format they’re familiar with. The changes, which are simple to implement, are good news for businesses who want to fully brand their Twitter page and users who like to share photos with their followers. 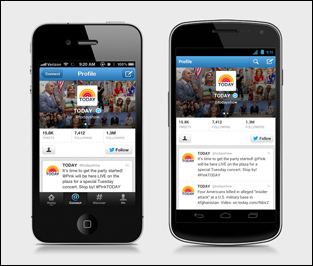 The Twitter new look will appear not only PC and Mac devices, but will also show up on mobiles and tablets. Go to your profile to see how it looks and voila! Many people already love Twitter and publishers and marketers alike will be pleased with additional options which allow them to connect more fully with their followers. Of course, it also gives potential followers the opportunity to see what kind of a user you are at a glance. The site currently has around 140m users and around 340m tweets are sent every day; whilst it still isn’t as popular as Facebook, many users who utilise both prefer Twitter as news spreads so quickly around the site. Not only has the social site updated its overall look for those who want to use it, but it’s also made changes to its tablet and mobile phone apps. These take into account the cover photo feature, although I found that whilst I could previously use two accounts on one app, it has now altered to only allow me to use one (unless of course I’m missing something). You may also notice that both the site and the apps have a new ‘button’ along the top of the site which has the usual home, @connect and #discover options along with a ‘me’ button for ease of access to your profile. Especially useful for brands is the ability to change backgrounds to enable more engaging content for followers. “Twitter users now have more control of the creative elements within the background image on their profile page,” Twitter said on its official blog. Whilst Facebook generally force such changes on its users, there’s no indication as yet that Twitter will follow suit and whilst the changes are now available to everyone, be it on computer, iOS or Android, there’s nothing to say you have to upgrade to the new style. However, we have all been waiting for a Twitter new look and it’s cleaner and simple to experiment with, so worth giving a try, especially if you’re a heavy user or a business looking to really strengthen your brand across all of the social platforms.